Green Bay's Jackson Perbix, Chicago's Matteo Pietroniro, Waterloo's Logan Stein earn weekly honors. The United States Hockey League announced the Forward, Defenseman and Goaltender of the Week for Week 18 of the 2018-19 season. 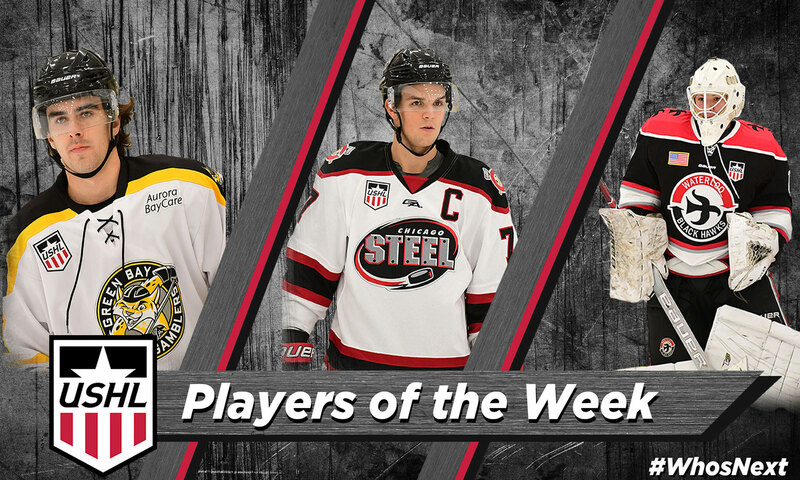 Green Bay Gamblers forward and Anaheim Ducks prospect Jackson Perbix, Chicago Steel captain Matteo Pietroniro and Waterloo Black Hawks goaltender and 2019 NHL Draft prospect Logan Stein all won their first USHL weekly awards. Perbix scored five times in two games over the weekend, including a hat trick on Saturday, Pietroniro found the back of the net in all three of his games en route to a five-point week and Stein helped Waterloo extend their winning streak to five games with a pair of victories, allowing just two goals and making 46 saves in the process. The USHL is America’s only Tier 1 junior hockey league, and continues to lead the world in the advancement of Division I college hockey athletes. Perbix scored twice on Friday in Green Bay's 4-3 shootout victory over Lincoln before recording a hat trick on Saturday against the Stars. The Elk River, MN native now leads the Gamblers in scoring with 31 points (9G, 22A) through 36 games. He is currently sporting a six-game point streak, with 12 points (7G, 5A) in that span and has recorded at least one point in nine of his last 11 contests, recording 17 points (8G, 9A) in those games. 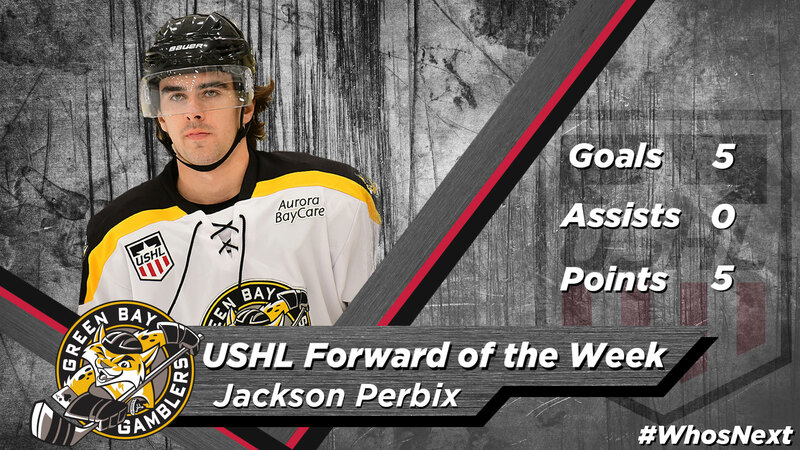 Perbix is in his first full USHL season after playing five games with Team USA during the 2016-17 season and suiting up in 17 games with the Gamblers in 2017-18, recording four points (1G, 3A) in those contests. Following the 2017-18 season, he was selected in the fourth round, 116th overall by the Anaheim Ducks at the 2018 NHL Draft. Perbix is committed to the University of Minnesota and was selected 15th overall by Green Bay in the 2016 USHL Phase I Draft. Prior to his time in the USHL, Perbix played for Elk River High (USHS). Pietroniro scored goals both Friday and Saturday night to help Chicago to victories over Team USA and Fargo, respectively. In Sunday's win against the Force, the Boise, ID native scored his third goal of the week, the game-winning tally, and dished out a pair of assists to lead the Steel to a 4-2 victory and extend the team's winning streak to seven games, the longest active winning streak in the USHL. The Chicago captain has been leading by example, with 33 points (14G, 19A) in 37 games, making him one of only three defensemen in the USHL to have recorded at least 30 points. He leads all blueliners with his 14 goals and is tied for seventh among defensemen with his 19 assists. 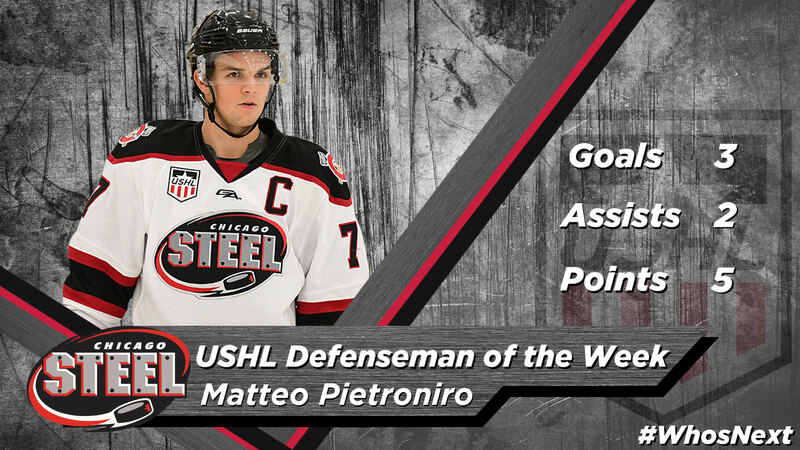 Among Steel players, he is second in points, third in goals and fourth in assists. Since Dec. 4, he is the seventh-highest scoring player in the USHL with 19 points (8G, 11A) in 14 games. The uncommitted defensemen is in the midst of his second season with the Steel, following a 2017-18 campaign in which he recorded 21 points (9G, 12A) in 53 games to help Chicago to the Eastern Conference Semifinals. He spent parts of three seasons in the QMJHL, splitting time between the Blainville-Boisbriand Armada and Baie-Comeau Drakkar. Prior to his time in junior hockey, Pietroniro played for Jonquiere Elites in Quebec. Stein came on in relief of Jared Moe nine minutes into Waterloo's game against Omaha on Thursday and stopped 27 of the 28 shots he faced to lead the Black Hawks to a 5-1 win over the Lancers. He followed that performance up by making 19 saves on 20 shots in a 3-1 victory over Cedar Rapids on Saturday to extend Waterloo's winning streak to five games. With the pair of victories over the weekend, the Ferris State commit improved his record to 11-3-1-0 on the season, and he now holds a 2.76 GAA and .894 SV%. His 2.76 GAA is good for fifth among all USHL goaltenders, while his .894 SV% places him just outside the top-10 in the league. Both numbers, along with his 11 victories, are good for second among all rookie netminders. Earlier this season, the Suwanee, GA native was named to the 2019 USHL/NHL Top Prospects Game, where he made 12 saves to help Team West to a 5-3 victory over Team East. He is eligible for the 2019 NHL Draft and is in his first USHL season. 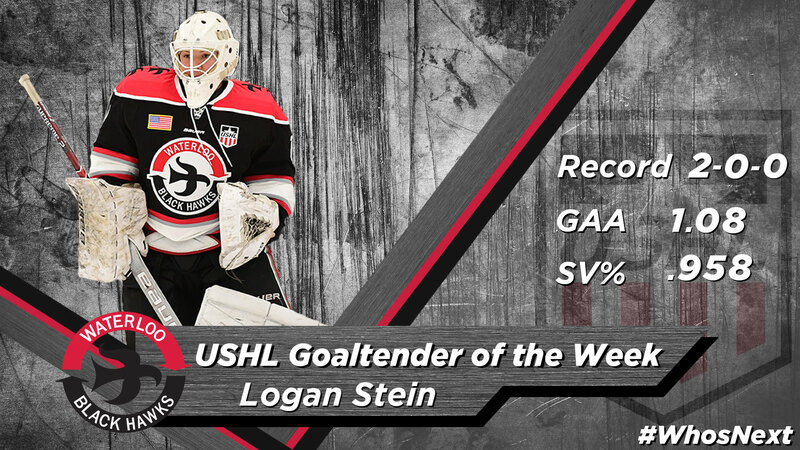 Stein was drafted in the 10th round, 159th overall by Waterloo in the 2017 USHL Phase I Draft and previously played for the Oakland Jr. Grizzlies (HPHL) and TPH Thunder (T1EHL).